Here is the site I frequent the most at this point in our homeschooling. I have a 9, 7, and 4-year-old. 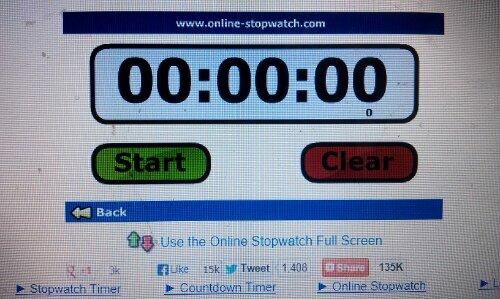 The computer sits right there where we homeschool, and when we do timed math tests, I pull up “Online Stopwatch” and off we go! Or when the house is a mess, a “countdown to clean” gets everybody pumping, too! Have a great day! Hope your kids are learning to their full capacity! This entry was posted in Homeschooling, Odds and Ends and tagged Homeschooling, math time test, stopwatch on September 5, 2013 by thehomeschoolingdoctor. I could use this to help me keep to my pacing times and not to over do it. Does it make the computer explode if I ignore it? I think I may need something on that scale. You made me laugh my seaweed out, you! Sorry to say, nothing that dramatic! Now I have a mental image of your computer screen splattered with green seaweed! Hehe! LOL! Funny how quickly things get done to a timer, isn’t it? Timers are a great way to motivate!